In Part 1 of Kerala Houseboats – The Essential Guide we explained that houseboats are converted rice barges hand built from traditional materials, that now feature comfortable and luxurious interiors and facilities for tourists. They are a wonderful way to explore the beautiful backwaters region. In Part 2 we let you know what to expect on a houseboat trip. What do trips on Kerala houseboats involve? Kerala houseboat trips typically last 22 hours, leaving at around midday and finishing at about 10am the next day. They don’t usually stop during the day, or include any activities – it’s all about leisurely crusing along and drinking up the sights floating past. At dusk the housboats moor at the riverbank in time for a beautiful sunset. You’ll stay here overnight and set off for your final destination in the morning. You can decide to start and end at the same place for a circular route (typically Alleppey-Alleppey) or travel from one place to another (i.e Alleppey-Kollam), which can be a great way of covering distance while having a break from public transport. You can hire an entire houseboat to yourself (popular with couples) or share a multi-room houseboat. Arrangements are very flexible and it is likely that you will be able to arrange a trip to suit your needs. You’ll have your own staff of 3 locals including a cook and 2 crew members. They generally stay in the kitchen area at the back of the boat, except for the captain who’ll be up front steering while the boat is on the move . Our crew were very friendly – the captain even let us have a try at steering the boat ourselves. An upper deck means even greater privacy, but generally the staff don’t feel instrusive of this romantic experience. Who takes a houseboat trip? 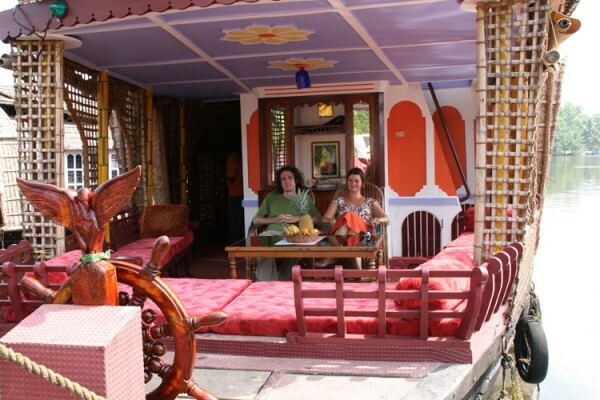 Kerala houseboats are a popular trip for many visitors to the region, both domestic and international. When we came across other houseboats they were most commonly occupied by honeymooning Indian couples. It is a lovely romantic trip for couples, but can also be great for groups of friends. Delicious! You have your own chef and three meals are included in the price, plus a big basket of tropical fruit, fruit juices and tea. It’s a great chance to sample traditional Keralan food made with fresh and tasty ingredients. Lunch is the main meal – we enjoyed a feast of nine different dishes! Rice, chutneys and a variety of vegetable curries. Dinner was simpler – rice, chapatis and two vegetable curries, but still lovely. We’re vegetarian and it was fantastic for us, but fresh fish is available and I’ve heard people raving about it. Breakfast was also Keralan style – dosas with coconut chutney, bananas cooked in honey and fresh pineapple. Again, very delicious and much more interesting than toast! Part 3 of Kerala Houseboats – The Essential Guide is now available and talks about the wonderful sights and sounds you’ll experience on a houseboat trip. Sign up to our RSS Feed to receive new articles direct to your reader. This entry was posted on Wednesday, August 26th, 2009 at 9:41 pm	and is filed under Kerala Houseboats, Kerala India Travel. You can follow any responses to this entry through the RSS 2.0 feed. Both comments and pings are currently closed.